Mother Teresa gave this speech at the National Prayer Breakfast in Washington, DC on February 3, 1994. She personally asked Fr. Frank and Priests for Life to spread her speech to everyone. This 5.5 x 8.5 flier contains dozens of practical things which individuals and groups can do to stop abortion. 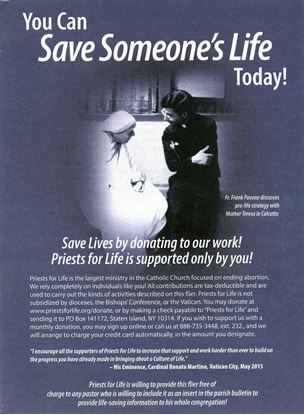 Priests for Life offers this to parishes for distribution or insertion into their Sunday bulletin! Read the text of this bulletin insert.